Sometimes the hardest part of the hike is getting the selfie. Yesterday, there were seven of us, and trying to get a shot where we can see all faces can be a challenge. The hike to Buffalo Mountain is one that I’ve done many times. The hike itself is not my favorite – it’s very short and not very challenging, but the vista is probably one of the best in this area. After last week’s hike, I thought these warriors deserved a break, so short hike/great view it was. As usual, pictures don’t do it justice. We had the mountain to ourselves, so we stayed up there and enjoyed it for almost an hour. Such an incredibly blue sky, another beautiful February day, it was so relaxing and peaceful to be there. My inspiration of the day came from a woman who has been hiking with me for a couple of years. I remember when we first started hiking, Joanne was afraid to get a good look, because she had a fear of heights (much like I did in the beginning). But yesterday, she climbed out on the rocks, looked over the edge and maneuvered her way around like a pro. She’s amazing! My little group keeps growing, and I’m inspired by the enthusiasm, the perseverance, and the joy that we all get from being together. Thanks for visiting, come join my group. When Mother Nature gifts you with a perfect Spring day in the middle of February, you have to jump on it. And that’s just what my Wandering Divas did yesterday. 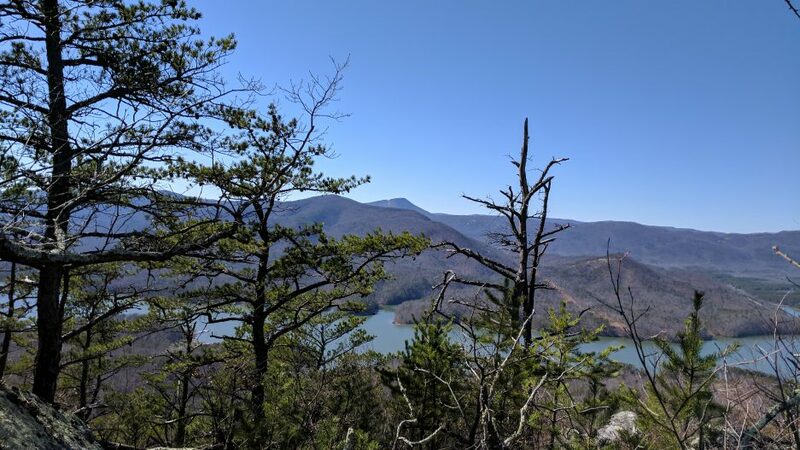 I’ve been putting off the hike to Angels Rest on the Appalachian Trail, until I was sure we were ready. This is a challenging climb – 1.7 miles with an elevation gain of 2000 ft. It is not for novices. After an exhausting climb, you just want to celebrate. It took us two hours to get to the top. But it was worth it, as usual. Just so you know where you are, this little angel serves as a reminder. The best views come a little further down the path at a place called Wilburn Valley Overlook. We took off in two groups to experience this view. In hindsight, it’s probably better if the whole group sticks together, because as three of us were just about to reach the site, the other group phoned to see which direction to go at the fork. We had completely missed the fork and were convinced that we had also missed the overlook. So we told them to stay put and we walked back to them. Oops! We had not missed the overlook, but by the time we caught up with each other, it was 3:30 p.m. Knowing how long it took to hike up, we decided we best get ourselves back down before the sun went behind the mountain. We arrived back at the car right at 5:00. Exhausted, exhilarated, and proud of our accomplishment, we rode home planning our next hike. Being the leader of a women’s hiking group means you have to make decisions: where to go, where to meet, and when to call off a hike due to weather. After carefully checking the weather for several days, I thought today would be a good hiking day – only 20% chance of rain and temps in the 40’s. So when I woke up this morning and heard rain falling, I jumped out of bed to check my local weather. Whew! It’s scheduled to stop around 8:00 a.m. and then be clear until evening. So I sent out an email that the hike was on! My group of seven, dwindled down to four. Great, we all fit in one car! But, about half way there, it began pouring, with the windshield wipers getting a great workout. Plan B was to drive around the park and then go out for lunch. What luck though, as we pulled into the park it cleared up. And these brave women were off! Though I’ve been to Hungry Mother a gazillion times, this was only my third climb to Molly’s Knob. It is a fairly steep, steady climb to the top, so we took several breaks along the way. Including this lookout of where we were headed, that’s Molly’s Knob. The last half mile is the steepest – I guess you have to earn your view on this one. It was not a great day for picture taking, but the view was really worth the climb. Just look at these happy faces. After a long rest, we headed back down. We immediately picked up a strong wind, a little rain, even a piece of ice fell from somewhere, but that only lasted a few minutes and then it was pleasant. We stopped at the lookout again and this time saw patches of blue sky. I checked three different weather sources this morning, one of them actually mentioned freezing rain, but I knew if I could just get one more person to go with me, that I really wanted to go today! So glad we didn’t have to cancel.